These days, if you want to be included among the ranks of wealthy Americans, you need to live in a household earning at least $121,116, according to the latest Census Bureau figures. In other words, your household must earn twice the nation’s median household income. But that figure is just the national estimate. Income disparities are so vast across the country that earning that amount makes you middle class in some cities but upper class in others. Below, we dig into data to find the income needed to be considered wealthy in the largest cities in America. In total, we looked at the largest cities to find where you need to make the most money to be considered wealthy. For this article, we considered the wealthy those in the top 20% of earners. Check out our data and methodology below to see where we got our data and how we put it together to create our rankings. Wide differences - Being rich in a city like Detroit is quite different than being wealthy in the Bay Area. The median household in San Francisco, for example, earns enough to put it in the top 5% of earners in Detroit. Additionally, 80% of Fremont households would qualify for the top 20% of earners in Detroit. A similarity across all the cities we analyzed, however, is that households must earn about twice the local median household income to be considered wealthy. Income inequality is worse in poorer cities - In the 10 cities requiring the least income to be wealthy, the distance between the lowest earners and the highest earners is larger. In these cities, the lower limit of the upper quintile is 5.6 times greater than the upper limit of the lower quintile. 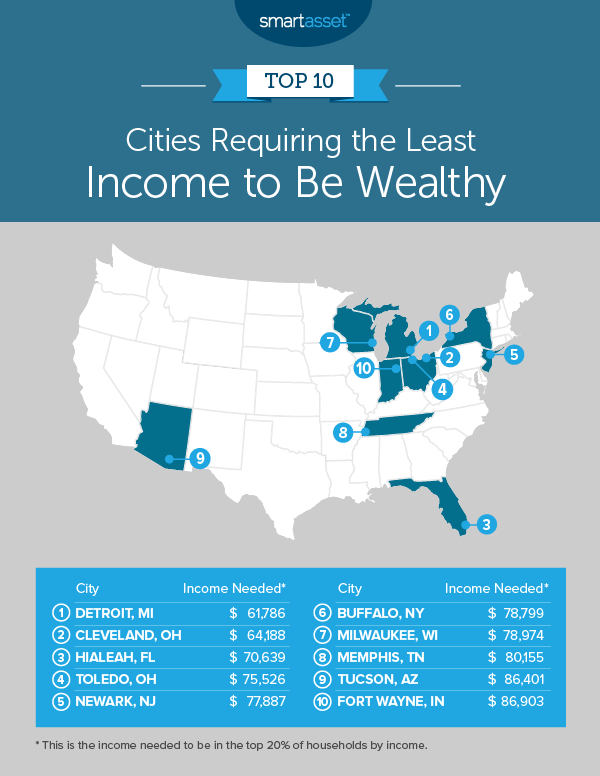 In the 10 cities requiring the most income to be wealthy, that figure is 5.2. Homeownership is tough for the rich in expensive cities - In the top 10 cities with the richest wealthy class, the average median-home-value-to-median-household-income ratio is 3.5 to 1. That’s certainly within the affordability range but still pricey for people who are much richer than their neighbors. Incomes in San Francisco are high, and if you want to count yourself among the highest earners, Census Bureau data shows you need to earn at least $231,000. That is roughly double the median household income in the city. Inequality in San Francisco is also very high. A household on the cusp of the top quintile of incomes earns more than seven times as much as a household on the cusp of the bottom quintile of earners. Also interesting is the fact that the median home in San Francisco may be slightly too expensive, even for the wealthy. The average home in San Francisco costs nearly 4.8 times the average wealthy household’s income. To be wealthy in Fremont, you need to earn similar amounts to what San Franciscans do. To be in the top quintile here, you need to earn at least $224,776. That’s roughly 76% more than what the median household earns. To be above the bottom 20% of households, you need to earn $67,000. That means even some of the least wealthy in Fremont earn more than the average U.S. household. We have ranked Arlington, Virginia as one of the most livable cities in America. It is even more livable, of course, if you have money to spend in what is a fairly high cost of living area. To be considered wealthy here, our data shows you need to earn at least $213,440. That is about 82% more than the median household income. The median household in San Jose earns a fairly substantial $83,400. But to crack the upper echelon of earners, households here need to have an income topping $204,000. Even with an income that high, you may find San Jose expensive, however. The median home in the area costs $854,700. The average household in Irvine takes in six-figures annually. But to be considered in the top 20% of earners, households here need incomes of $196,109. The average home here costs more than $800,000, though, so even earning enough to qualify for the top 20% may not mean you can easily become a homeowner. Washington, D.C. has some of the highest inequality in our study. The bottom 20% of households here earn less than $24,074, while the top 20% earn more than $180,000. That is a difference of nearly 7.5 times. The top 20% of earners also earn at least 2.2 times what the average household in the nation’s capital earns. Scottsdale is another place where to be considered wealthy, you really need to bring home the big bucks. The wealthy in Scottsdale -- those with income high enough to be in the top 20% of earners -- take home at least $179,000 per year. Unlike with some other cities on this list, being among the wealthy in Scottsdale is comfortable. The cost of living here is fairly low by the standards of this top 10. The median home costs just $473,300. It takes a lot to crack the upper echelon of Seattle incomes. The top 20% of households earn at least $172,000, roughly double what the median household in the Emerald City makes. Even the wealthiest in Seattle have to make some tough decisions about their finances. Homes here are expensive: Census Bureau pegs the median home value in Seattle at more than $673,000. On the plus side, though, being rich in Seattle means access to some of the best coffee and beer in the country. Texas’ lone representative on this list is Plano. To enter the ranks of the wealthy in Plano, you need an income of at least $165,558. Even more than in Scottsdale ranked above, being wealthy here enables you to save quite a bit of money. The average home, for example, is worth less than two years’ income for those earning $165,558. It turns out you need to earn more in Jersey City to crack the top 20% of earners than you do in New York City. To rank among the highest earners in Jersey City, you need an income of no less than $159,927. In New York (ranked 19th), that figure is $138,286. Jersey City is also another city with startlingly high inequality. There are just as many households in Jersey City living on less than $24,408 than there are households with an income greater than $159,927. To be in the top 20% of household incomes in Detroit, you need to earn $61,786. Despite that fairly low figure, Detroit still has relatively high inequality. The number of households in Detroit that live on less than $10,000 per year is the same as those that earn at least $61,786. Fortunately, Detroit is a fairly affordable city. The median home costs just $50,200. The tip-top of earners in Detroit, the top 5%, earn more than $119,376. Households with incomes in the top 20% in Cleveland earn at least $64,188. That is roughly 2.2 times the local area median household income. Like in Detroit, the top 20% earn quite a bit more than the bottom 20%. Data from the Census Bureau shows that the highest quintile of household income is six times the lowest quintile here. Hialeah homeowners struggle to afford their homes, past research has shown. One reason for this is the low incomes in the region. The median household in Hialeah has an income of $34,512. The wealthy in Hialeah earn $70,639. But even the wealthy may struggle with homeownership. The median home here costs $232,600, a fairly high figure given the low incomes. A household income of just $75,526 will earn you the label of wealthy in Toledo. Like other Midwestern cities, homes here are affordable, especially if you are wealthy. According to Census Bureau data, the median home costs just $78,400. To make the jump from wealthy to rich in Toledo, you need to go from earning $75,526 to $125,847, which is the cut-off for being in the top 5% of earners. In contrast to neighboring Jersey City, you don’t need to earn much in Newark to be wealthy. According to Census Bureau data, to rank in the top 20% of households by income, you need to earn just $77,877. For the average household to crack the top 20% of earners, it will need to double its income. To move from being the top quintile to the top 5%, you will need to double your income once again. The top 5% of earners in Newark earn no less than $150,895. Some 50% of Buffalo households live their lives on incomes of less than $34,814, including 20% who make due with less than $13,054 a year. On the other end of the spectrum, the wealthy, with six times as much income, earn $78,799. For the wealthy in Buffalo, homeownership is easily attainable. The median home here costs $92,700. In Milwaukee, earning more than $78,974 per year would give you a higher income than 80% of households. To be in the top 5% of earners, a household would need to earn $138,372, roughly the same as the median household income in Fremont. In Memphis, a household income of $168,506 is more than what 95% of Memphis households earn in a year. To be in the top 20% of household incomes in Memphis, you would need to earn more than $80,155. Consistent with what we’ve seen in other cities, to make the jump from average household to wealthy household, you must double your income. 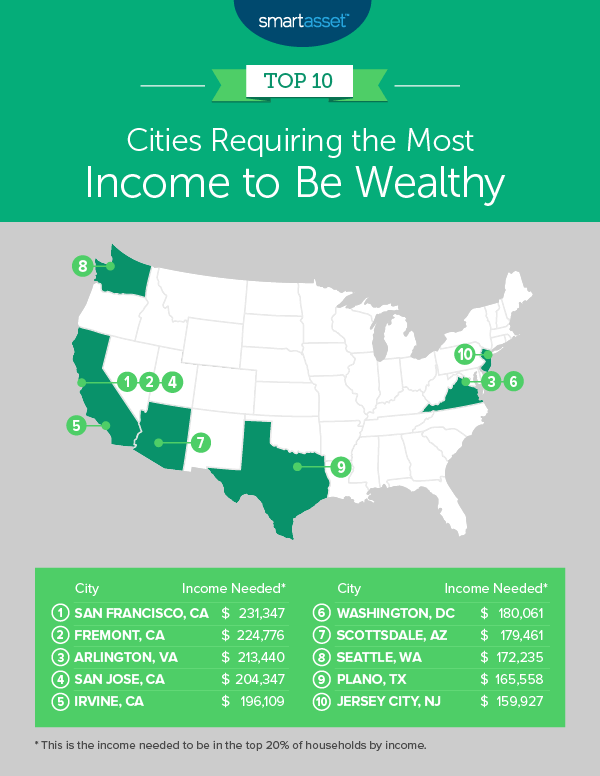 Tucson, Arizona takes ninth for where you need to earn the least to be considered wealthy. To have a higher income than 80% of households in Tucson, you need an annual income of just $86,401. Income inequality here is a bit high, though. The top 20% of earners have an income five times greater than those in the bottom 20%. Fort Wayne has the lowest distance between the bottom quintile and the top quintile in this top 10. The bottom quintile earns less than $21,144, while the top quintile, what we considered the wealthy for this study, earns at least $86,903. Other good news is that the distance between the median income and the top quintile is also not that large. In order to find out how much you need to earn to be wealthy in America, we looked at data from the U.S. Census Bureau’s 2017 1-Year American Community Survey for 100 of the largest cities. We found the minimum income a household could earn to be considered part of the top 20% of earners and ranked the cities from high to low based on this figure. Take advantage of compound interest - Even modest investments over time can become robust sources of income. Imagine you have worked for a bit and have managed to save up about $10,000. Instead of resting on your laurels, if you invest that 10,000 over 30 years with 6% returns, it would ultimately be worth over $57,000. If you continue to save and invest, you could start making some serious money. Get an expert’s opinion - When you are dealing with building wealth, all sorts of things can get in the way. A bad investment, taxes or a poorly structured portfolio can all slow you down from hitting your financial goals. Instead of trying to make all your investment decisions by yourself, why not work with a trusted financial advisor? If you’re not sure where to find one, check out SmartAsset’s financial advisor matching tool. We’ll pair you with up to three experts in your area who can best meet your particular financial needs.